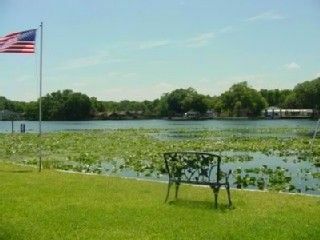 This pristine area is located on the St. Johns River in the heart of the Ocala Forest. Imagine a drift in time to a Florida that few experience. Gentle breezes & fresh sweet air with the hint of blossoms smells from some far off grove hidden in the dense tropical forest. Canoeing with such a vast variety of birds too many to name. Alligators patrolling the shores looking for fish peeking from under the water hyacinths. Sounds of nature like a symphony to hear. Private little fishing community right on the St.Johns River..
Screen in boat house for boat as well. Nicole's bedroom has QUEEN size bed. Activities: Fishing, Hunting,Canoeing,Kayaking Snorkeling, Swimming, Wildlife Nature Photography. Location is the best , one of the nicest spots on the River. Fishing is incredible the hot spot is in front of my house . The major attraction was the view of the River . We are loCated on the River & Canal we have porches on both . This home is on the St Johns River 1/2 way between Ocala and Ormond Beach. St. Johns River and the Ocala National Forest borders Astor.